Life Insurance Corporation (LIC) is a very known brand as many in India would have grown up hearing this name & still continue to hear.This could be one of the reason behind the enormous response for LIC AAO 2016 recruitment announced recently.Even bank jobs aspirants have started to compare Bank PO vs LIC AAO.Hence we thought of putting all the information about these two jobs, so that you decide on which to choose. Banks help us to save & receive money (loan) during our lifetime. LIC is the market leader in selling insurance policies which is a product that provides security to our family after our lifetime. Though there are fundamental differences between the two sectors, candidates always want to be part of a better career.So this comparison shall set things straight admist the confusion. First of all, you can become a bank PO only after qualifying IBPS PO exam.This is a common recruitment for all the 20 public sector banks in India & you may be appointed as PO in any of them. LIC has over 1.10 lakh employees & hence conducts a seperate AAO recruitment whose pattern is similar to that of bank exams. Just because there are no targets for AAO, it is not a stress-free job.In a large organisation like LIC, administrative workload shall be enormous. Coming to working hours, bank officers can be seen working till 8 PM.With the announcement of holidays on alternate saturdays, things are looking okay but still there is hectic pressure on them during weekdays. In LIC, it is a 5 day work week as all saturdays and sundays are holidays for them. While a PO in govt bank receives Rs.34 - 38,000/ month (in-hand) the LIC AAO salary gets around Rs.33 - 35,000/ month which is under revision after the govt agreed for 15% hike. The basic pay of LIC AAO shall be Rs.32,000 (existing is 17,000) as per the proposed revision in payscale.It is higher than the base of Rs.23,000 for bank PO. Once the new pay is implemented, the take home salary of LIC AAO will increase to approx Rs.42 - 45,000/ month. Although the salary negotiations for banks & LIC will happen once every 5 years, the current difference will continue between the two for a long time. Bank PO & LIC AAO are transferable jobs as they have branches all over India.On an average, you may expect a transfer every 5 years. If you are posted out of your hometown & looking to return after 2 or 3 years, it could be difficult.There will be many senior officials who are on the verge of retirement wanting to get back to same place you are looking at. Transfers are mostly made on seniority basis in banks and LIC.Believe me, huge no. of requests citing various reasons are still pending in these organisations. There could be some relaxations for women employees though which entirely depends on the sanctioning authority. LIC has most of its branches in cities and towns only.But banks have many rural branches located in interior villages too.So if required, a bank officer should be able to work in those areas as well. In banks, a PO who joins as scale I can move up to become Assistant Branch Manager, BM, AGM, GM etc., in scale II, III IV cadre. You would become eligible for internal promotion exercise in 4 or 5 years itself as promotions have been fast tracked to fill vacancies generated by retirements in higher scales. LIC AAO can become AO > ADM > DM > ZM but we hear the promotion policy in LIC is not proactive like in banks. As per current employees, It usually takes atleast 8 years for an AAO to become eligible for AO promotion. Read LIC AAO 2016 Recruitment Notification for more details on eligibility conditions, exam pattern & study materials. So What I Must Do? 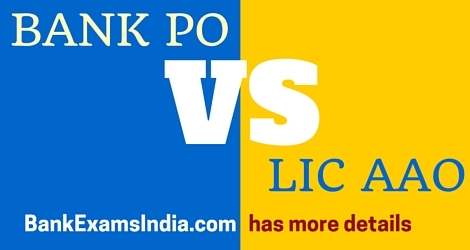 Having read through the comparison of LIC AAO vs Bank PO, you must have understood the advantages & disadvantages between both the jobs. In terms of work, salary & personal life LIC AAO is a better option compared to PO but for some Bank PO is all about Power, Authority & Fulfilment. Since they move close with people, bank officers play a major role in changing the lives of a common man.There are many stories where normal customers go on to become very close friends. Each job has its own set of qualities.We cannot term bank PO job is good OR LIC AAO is good.Whatever be the choice, you become what you believe in. The following quote by Shri.Ratan Tata sounds very apt in here. What is your decision? Lets hear voice of future officers via comments below! !